Admire this vast collection of maritime treasures, and learn all about life at sea through the ages. The International Maritime Museum Hamburg traces over 3,000 years of nautical history, exploring our ever-changing relationship with the world’s oceans. You’ll discover priceless exhibits and artefacts, from ancient dugout canoes to the first navigational instruments and maps, all housed in this enormous 11,000-square-metre space. This museum owes its existence to Professor Peter Tamm, a journalist and former CEO of the Axel-Springer company, who, from the age of six, dedicated himself to building up the largest private maritime collection in the world. Since June 2008, the museum has occupied the vast Kaispeicher B building, the oldest of the warehouses to be conserved in the city. The exhibition spans ten floors, or “decks”, each dedicated to a different aspect of maritime history. Discover how shipbuilding techniques illustrate the technical capabilities and advances of each century, from the hollowed-out tree trunk canoe recovered from the bed of the River Elbe, to the sketches and models made by 17th-century craftsmen, and the detailed technical blueprints required for modern-day vessels. Learn about how our view of the world has changed, thanks to the collection of historical charts and maps, including the “Atlantis Majoris” of 1657, and marvel at the precision of the sextants and compasses that enabled ships to stay on their course. The museum also holds an extensive collection of memorabilia from around the world, including uniforms, weapons and medals from the navy, and documents and photographs from the major commercial lines. Whilst much is on display, the museum’s archives also hold over 15,000 paper copies of cruise ship restaurant menus, as well as 47 of the original letters written by Admiral Lord Nelson. Some of the information panels provide details in English, but for more in-depth descriptions, you may want to pay for an audio guide, available at the entrance. The International Maritime Museum is open every day except Mondays. An entrance fee is payable, but family tickets are available. The closest U-Bahn station is Überseequartier. 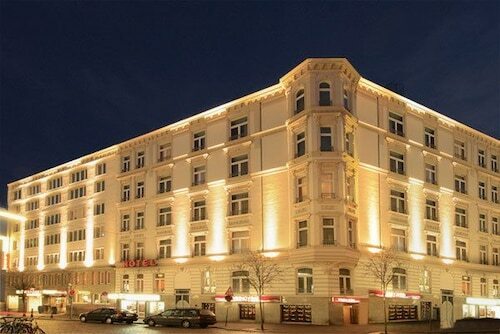 This great German city’s halls of power are housed in a suitably magnificent building, a vast and ornately decorated sandstone structure with even more rooms than the Buckingham Palace. See majestically decorated halls where the German government convenes or tour picturesque gardens at this town hall, which houses an impressive 647 rooms. Admire plants from all corners of the globe, and from all eras of evolutionary history, at these fascinating and educational gardens. Learn all about traditional Japanese customs when you visit this beautifully landscaped oriental garden. Start your Sunday in traditional Hamburg fashion with a trip to this sociable open-air market. Marvel at this miniature world, criss-crossed by model railways, ships and aeroplanes, all recreated in astounding detail. Admire some of the oldest works of art in Hamburg housed in this impressive cathedral, which amazingly survived the devastation of World War II. As one of Germany’s leading art institutions, this museum showcases a world-class collection of masterpieces from the 14th century to the present day. Visit this historic riverside church to enjoy the haunting sounds of the recently restored organ that was much admired by the composer Bach. Test your sea legs aboard the world’s largest functional museum cargo ship, and learn all about life on the oceans. See how the city has developed over the past 12 centuries, thanks to this fascinating collection of historical artefacts. Immerse yourself in the darkest periods in Hamburg’s history; this is a truly unforgettable experience, not for the faint-hearted! See the best of contemporary art exhibited in the three distinctive venues of one of Germany’s leading cultural institutions. Soak up the sights and sounds and enjoy the thrills and spills of this historic festival, one of the largest in the whole country. Discover this fascinating city-centre district on the banks of the River Elbe, where former docks are blossoming into a dynamic cultural hub. 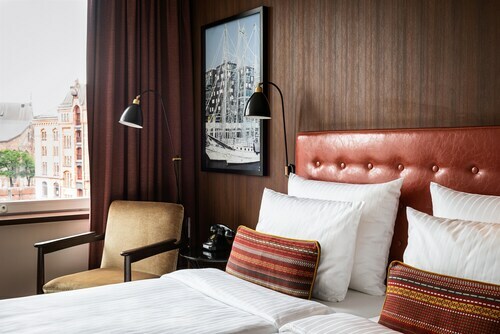 Located in HafenCity, this spa hotel is within a 10-minute walk of International Maritime Museum, Miniatur Wunderland, and Hamburg Dungeon. 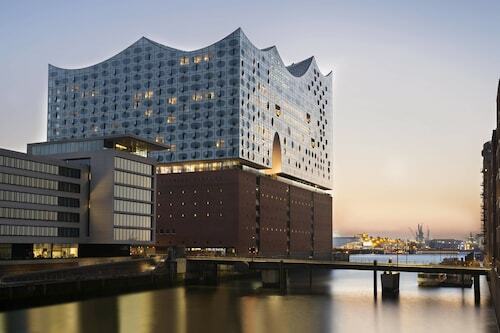 Elbe Philharmonic Hall and Hamburg Cruise Center are also within 15 minutes. Messberg U-Bahn is 10 minutes by foot and Steinstrasse U-Bahn is 12 minutes. 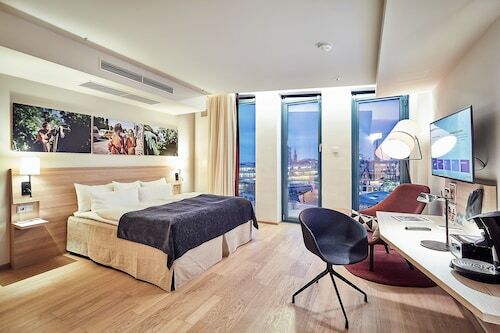 Located in HafenCity, this luxury hotel is within a 10-minute walk of Elbe Philharmonic Hall, Miniatur Wunderland, and Hamburg Dungeon. St. Michaelis Church and Cap San Diego are also within 15 minutes. Baumwall U-Bahn is 7 minutes by foot and Rodingsmarkt U-Bahn is 14 minutes. 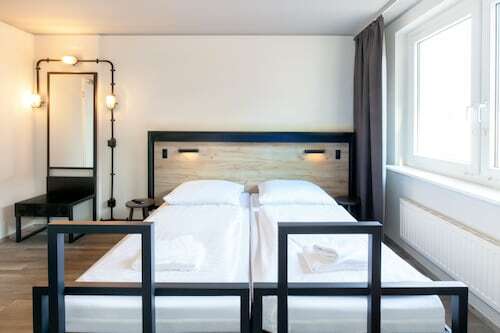 Located in Saint Georg, this hotel is within 1 mi (2 km) of Museum of Arts and Crafts Hamburg, Moenckebergstrasse, and Hamburg City Hall. Miniatur Wunderland and Hamburg Dungeon are also within 2 mi (3 km). Lohmuhlenstrasse U-Bahn is 6 minutes by foot and South Central U-Bahn is 7 minutes. 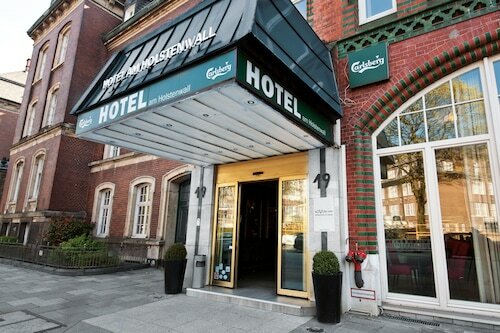 In the city center, this red-brick hotel stands along one of Hamburg's many canals. City Hall, St. Michaelis Church, and Monkebergstrasse are within 0.9 km (0.5 mi) away. U-Bahn station Rodingsmarkt is nearby.